This prosperous mid-sized college city of 171,000 is located north-central Alabama. Huntsville is known as the "Rocket City." It has achieved some fame for its NASA Marshall Space Flight Center , the Redstone Arsenal, and as a high-tech center. It is also become a popular destination for individuals from all over the country, based on availability of desirable housing, beautiful parks, and a vibrant commercial and cultural infrastructure. The population grew over 13% from 2000 to 2008. The University of Alabama at Huntsville is the largest of several colleges in town, which gives a youthful boost to the community. 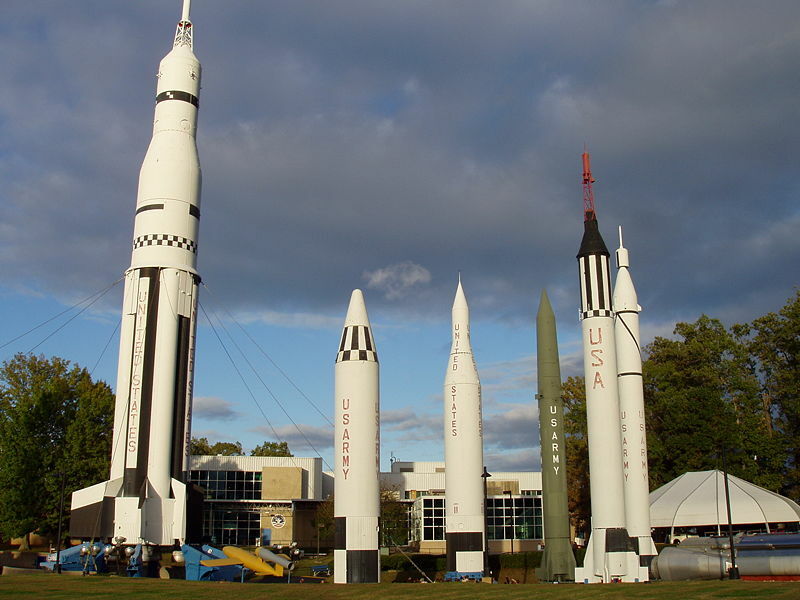 Picture of rockets in Rocket Park courtesy of Wikipedia and Daderot. Huntsville is situated in the Tennessee Valley of Madison County known for its beautiful mountains and karst landscapes. There are several historic neighborhoods to live in, including the Twickenham Historic District, which features homes in the Federal and Greek revival styles. Two others are the Old Town and Five Points Historic Districts. There are also many nice active adult and 50+ communities in the Huntsville area (see link at top left). The NAR reported the median sale price to be $218,800 in the 4th quarter of 2018, up over 10% from a year earlier. Zillow calls Huntsville a "Very Hot" market in early 2019, reporting the median home value to be $151,800. NASA Space Center, Redstone Arsenal, the huge (2000 acre) Mante Sano State Park, symphony, museums, 10 public golf courses, the Von Braun Center (10,000 seat), and numerous cultural festivals like the Spring Jam. Plus many new 55+ communities to choose from. University of Alabama at Huntsville and other colleges. Highly educated population. 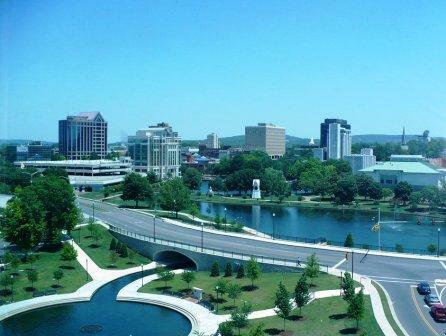 Huntsville was ranked #8 on CNN/Money's list of the Top 25 Places to Retire. Summers are very warm and humid. Growth is rapid and traffic can be thick. Huntsville is on the northern border of Alabama in the middle of that border. It is in the Tennessee River Valley. Summers are hot and humid, average January temperature is about 40 degrees (F.). Culturally, Huntsville is the leading city for many miles; It has the Fantasy Playhouses, the Huntsville Theatre and Merrimack Hall Performing Arts Center; festivals include the Big Spring Jam, Panoply Arts Festival, ConS+ellation sci-fi convention; U. of Alabama - Huntsville; Its Symphony Orchestra is the oldest in the state; The extensive Huntsville Public Library has 12 branches througout the city. According to city-data.com, the 2013 crime index in Huntsville is 473.5 which is much higher than the national average of 295. Violent and property crimes are also well above average. As in many cities, crime rates have a lot to do with neighborhoods - some have very high rates and others do not. Huntsville Hospital System and Crestwood Medical Center are highly rated. Huntsville International Airport; Huntsville is below average in walkability when compared to other communities.